23 April - A pleasant day until the early evening when drizzle moved in. After a very busy day yesterday with a very active little boy, today has been a bit of a rest day. As usual on a Wednesday, the morning started with getting Evan ready for nursery/pre-school. In reality, the day begins when Evan peeps around the corner of his curtain and announces "It's morning time!". Today he was anxious to get downstairs more quickly than usual, not to get to nursery but rather to see the Sparrows in action in their nest box, and I had to print out a couple of pictures so that he could show them to his friends. By breakfast time the Sparrows were already hard at work in SW(lo). 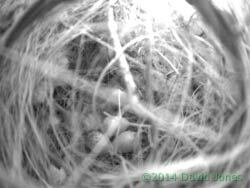 As this picture shows, the nest is getting close to completion. For the first time feathers were brought in this afternoon, which is a good sign, and so far there has been no attempt to create a dome. I still need to start to catch up with the large images for the entries since March 26. Also I would like to set up the nest box diary. A quiet couple of hours during the holiday is called for! Yesterday afternoon we went on one of our frequent bugs hunt down the garden and Evan spotted this tiny millipede coiled up under a flowerpot. We brought it indoors in a container so that we could take a closer look at it. 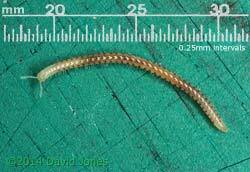 Once uncoiled it turned out to be just over 13mm long. It gave me the chance to introduce Evan to a very simple electronic magnifier that his two cousins had already tried out just before Easter. Called an Easi-Scope it 's a plug and play device. Pressing a button on top of it starts up a simple viewing window, and then pressing the same button will capture an image of whatever you are looking at. 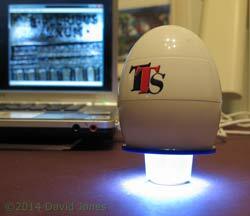 The top of the 'egg' rotates to focus. It is seen here standing on is an add-on spacer to keep the magnifier a fixed distance above the surface. Evan had great fun trying to follow the millipede with the scope, and everyone had to see the big millipede! I see that the company also makes an auto focus version which I may look more carefully at in the future. 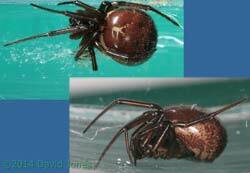 The larger of the two False Widow spiders is being kept in one of my narrow aquarium tanks for the time being so that I have the option of photographing it from either side. However, last night it had eaten a couple of small insects that I put in for it, and perhaps for that reason it wasn't at all active today when I tried to photograph it, so I took just a few shots before leaving it in peace. I did attempt to photograph its fangs but they were not visible. 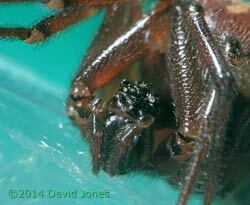 However, in the centre of the image you can see two black structures called the chelicerae. The fangs are found at the lower ends of these and are normally folded inwards. 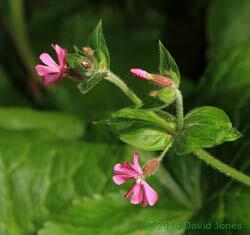 I'll need to photograph the spider from below to see them - a job for another day. 24 April - A pleasant day with hardly a breeze and a high of 17C in the late afternoon. A couple of first flowerings today, the first being the Triangular - stalked Garlic. As I knelt down to take this photograph the smell of garlic was almost overpowering - I hate the taste of garlic in food - however, the flowers are well worth the effort! 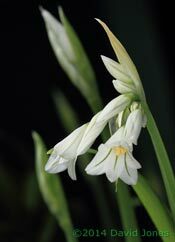 Like the Wild Garlic, these plants are gradually establishing themselves in several parts of the garden. 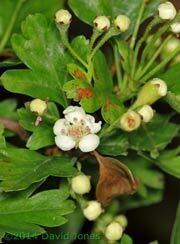 After that photograph was taken I moved on to the Hawthorn, searching for signs that the flower buds were near to open. I found several buds that looked as though they would burst within the next twenty four hours, but then after what seemed like a fruitless search I spotted this lone flower lit up by late afternoon sunshine. The plants that will soon dominate the garden are the Red Campions, and I missed photographing the first flowering of this years plants. The event occurred on Tuesday (22nd) - perhaps I should blame Evan for distracting me! 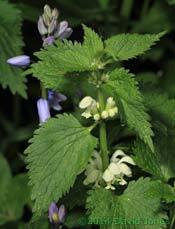 And I completely missed the flowering of the White Dead-nettles, which must have happened last week. The Sparrows have been very busy today. The bottom of the box is now completely covered and some interesting materials have been brought in, making me wish that I had a colour camera installed in the box! 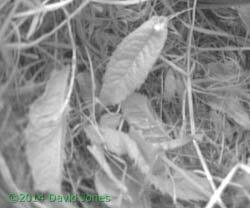 and fresh leaves, most brought in by the female, although I think the male delivered a few small pieces. During past nesting seasons I've often watched Sparrows pecking at young leaves and even flower buds on our Buddleia, but this is the first time I've seen them brought into a nest, along with leaves form a different (unknown) plant. And today I saw the male preening the back of his partner's head for the first time while they paused together for a short time in the poorly defined nest cup. 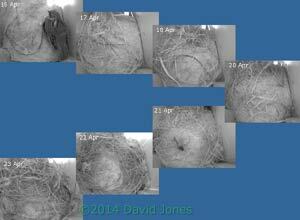 Finally, two images to illustrate the change in the nest over the last twenty four hours. Both images were recorded in the even after visits had ceased for the day. 25 April - A washout, until the evening when we had a glimpse of the sun as it was about to drop behind the conifers! It was a case of drizzle or heavier rain almost continuously all day. I had to go out numerous times and by the time I parked the car at home for the final time I'd decided that new windscreen wipers may be a good idea! 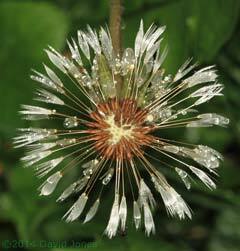 And in the garden, this drenched and rather battered Dandelion seed head provides perhaps the most photogenic comment on the day. 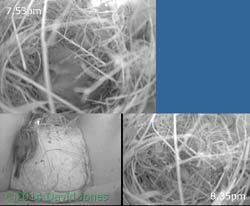 The weather also meant that very little was done in the nest box since yesterday evening. 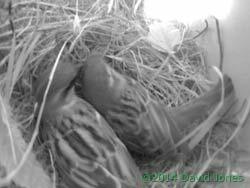 This evening the Sparrow pair paid a brief visit to the box at just after 8pm. 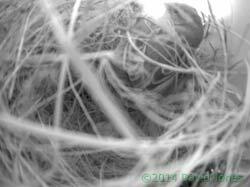 On a brighter morning the male Sparrow entered the box at 6.04am and gave the nest a quick inspection. However, the female waited until 6.30am before arriving. 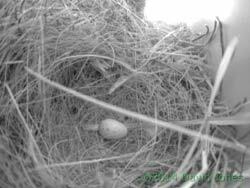 Once in the box she settled down quickly and laid her first egg at 6.43am. A sparrow eggs are white with reddish-brown blotches, although these seem quite small on this example. 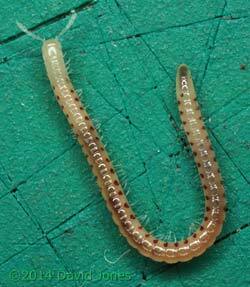 egg size is 20-22mm long and 14-16mm wide. We can expect 3-5 eggs to be laid, and incubation will then go on for about 11 days. The female remained on the egg until the male visited just after 7am and then the pair resumed the process of bringing in straw to build up the sides of the nest. Shortly before 10am I spotted Sparrows pecking at the leaves at the top of the Buddleia bush, and sure enough, shortly afterwards leaf fragments were brought into the box and placed around the egg. 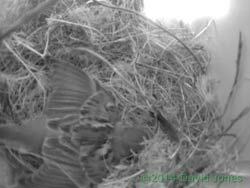 Since then more straw has been brought in and the egg is sometimes completely obscured! Today, rather than looking after Evan we are 'baby-sitting' his (and his dad's) pet Labrador, called Betty, while dad and son head off to a zoo with some friends! Anyway, I took Betty for a walk through the Brickfields Country Park where I was treated to a 'I wish I had my camera with me' moment when a pair of very fresh looking Orange Tip butterflies fluttered past us and landed side by side on a Garlic Mustard plant, which is a food plant for their caterpillars. 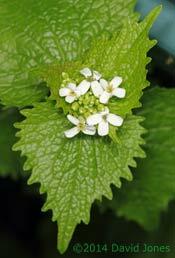 The Garlic Mustard is also a well established plant in our garden and while I saw several Orange tips visit they did not lay eggs. I'm keeping my fingers crossed that we will have better luck in 2014. When we returned home I checked our Garlic mustards. While most are still small a few have reached maturity and two have started flowering, either this morning, or during yesterday's rain, which I think is less likely. In the late afternoon Evan and his dad called in on their way home from a very successful expedition to Marwell Zoo, and the first thing Evan did was to check on the nest - giving a very satisfied 'wow' when he saw the egg! I've now made a couple of 'Sparrow eggs' out of Play-Doh so that he can see just how big they are when he visits us again tomorrow. 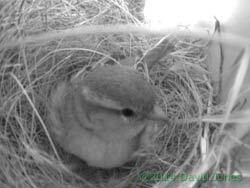 This evening the female Sparrow appeared to be settling on the egg before 8pm. She remained in place for about twenty minutes before moving closer to the exit. Then, just after 8.30pm she left the box. Moments later a female entered SW(up), the box immediately above SW(lo). She has settled down in there, adjacent to the entrance and I can only assume that she is the female from SW(lo). In that box the egg is now just visible amongst the straw. 27 April - The first visitor to SW(lo) this morning was the male at around 6.05am. He appeared five times before the female left SW(up) and entered the box. 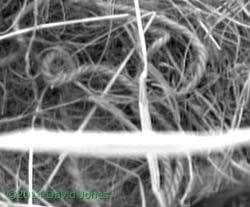 For the next couple of hours both birds came in and out, each time bringing in more straw which was added to the back of the nest ((left side of cctv image). 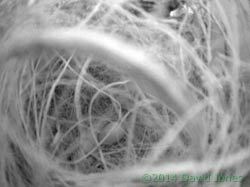 the effect of their efforts built up the rear of the nest so that more and more straw started to topple over to produce the canopy that I was hoping wouldn't develop. This picture shows the female leaving the box at 7.50am -by now I needed to look carefully to see that there was still just one egg present. That was still the case mid-afternoon when I captured this clearer image. During the day the sparrows did spend short periods sitting on the egg, but tonight the female is once again roosting in SW(up). On a dull morning the Sparrows have their second egg. 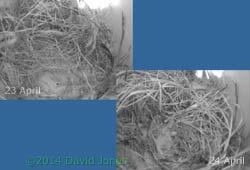 It is now getting very difficult to see into the nest, but I did catch this glimpse of two eggs at around 8.45am. Tonight the female is sitting on the eggs rather then roosting in SW(up). A showery day - this afternoon we missed a big thunderstorm that passed by a couple of miles north of us as it headed west. The funny thing about that was that no more than ten minutes earlier little Evan announced (without any prompting) that there might be a thunderstorm, and we spent the next few minutes creating pretend thunder by stamping on the wooden decking. Five minutes or so later we heard the real thing! There was no sign of lightning, but our electricity supply suffered a momentary loss, enough to stop our kitchen clock at around 3.30pm, as well as causing the recorder linked to the Swift box cameras to switch off. 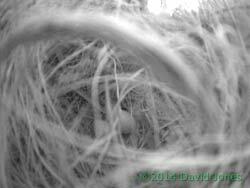 In SW(lo) the egg count is now up to three. 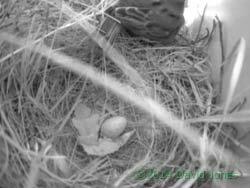 During the day there has been a sparrow sitting on the eggs quite frequently but it was not as continuous as I would expect once laying is complete. 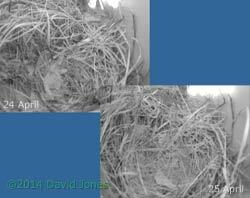 I'll be watching out for a fourth egg tomorrow, nest canopy permitting. Much of our day with Evan was spent on hunts for interesting things, from Oak galls and Horse Chestnut flowers in the local park to slugs, snails, beetles, spiders and worms in our garden, with grandma having to be so brave when she was required to handle them - the slug being a special treat! Evan also helped to make an insect hotel out of an orange juice container (with its top and bottom removed to create a wide tube) that we stuffed full with lengths of dead Buddleia stems. These have pith-filled cores that can be burrowed into easily by insects such a solitary bees and wasps. I'm catching up slowly with the backlog of missing large images - these have now been added for all of April.